Our friend Thomas in Thailand sent me a link to this little hot hatch being put together by Toyota tuner Gazoo. This is the Vitz GRMN Turbo—a turbocharged version of the Toyota Yaris sold in North America and other parts of the world. Making 152 horsepower and 152 ft/lbs of torque, this hot hatch will exponentially increase the car's fun factor. In addition to its turbocharged 1.5-liter engine, the car also gets vented disc brakes, a stiffened body, custom seats and interior bits, and BBS wheels in addition to the GRMN-tuned suspension. I love the front fascia, which looks very similar to the Yaris Hybrid from Europe. By the way, there will only be 200 of these puppies made, and they're only available in white or black. I'm sure there's no chance we'll see this hopped-up Toyota on this side of the pond, but regardless, it looks darn good. 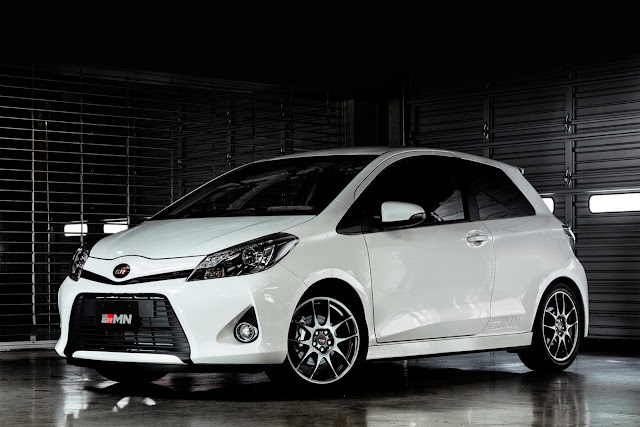 Check out the video for the Vitz GRMN Turbo in action. Thank's again to Thomas for the tip. Got a tip? Contact us!